The Spitfire is truly a plane to be admired, loved even (by plane lovers if you know what I mean). As a pommie-born Kiwi (English born New Zealander) of 1960 it goes without saying that I’m affected by the Spitfire’s spell. This is despite having a real fondness for ugly French planes of the 1930’s that I build whenever possible. Despite my appreciation of Britain’s most famous fighter, I try to avoid getting too anally-retentive as some Spitfire modellers can be prone to be. Instead I aim for a general accuracy within reasonable limits. These limits are premised on averaging 12 models finished a year, and always aiming for 24. The Spitfire Mk. 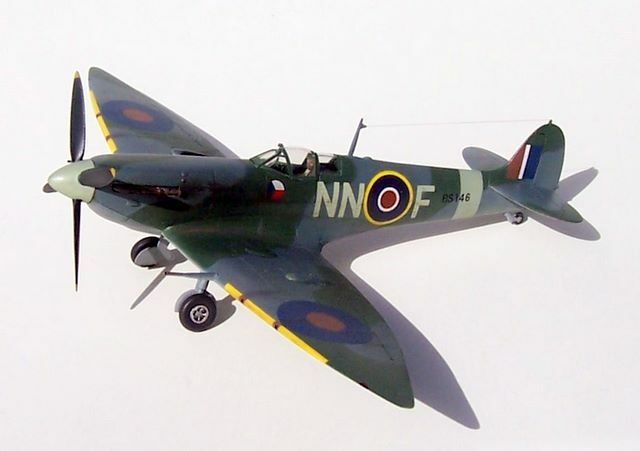 VI was the first high-altitude version of the type, and actually the first production version of the Spitfire fighter which underwent a major redesign from the Mk. I. It was designed to deal with the threat posed by very high flying Luftwaffe aircraft, especially the Junkers Ju 86. The Mk. VI used the same airframe as the Mk V, but equipped with pressurized cockpit, extended wingtips and a Merlin 47 engine driving a four-bladed propeller. The aircraft was not a great success. Its pressurised canopy posed numerous problems, making it unpopular with the pilots. Also, its performance was not as impressive as had been hoped..
Ninety seven Mk. VIs were built between December 1941 and October 1942. My model is an amalgam of the Revell Mk. Vb, Airfix Mk. Vb, Heller Mk. XVIe and Smer Mk. VI The Smer kit is itself a modification of the old Heller Mk. V with the parts to make a Mk VI, these being the wing tips, 4-blade prop, cockpit pressurisation intake and markings. I used the Revell Mk. V as the main basis of my airframe. 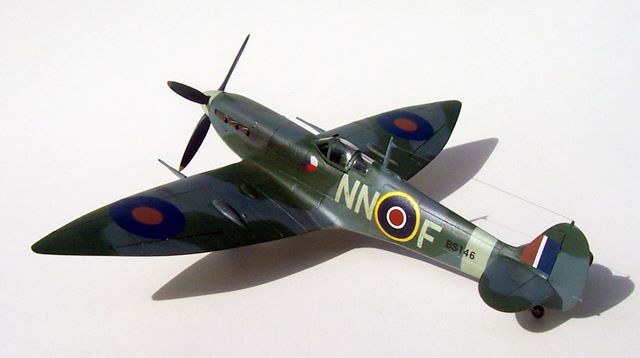 A friend of mine who restores Spitfires for a living, and who is an excellent modeller, believes the Revell kit to be very good. 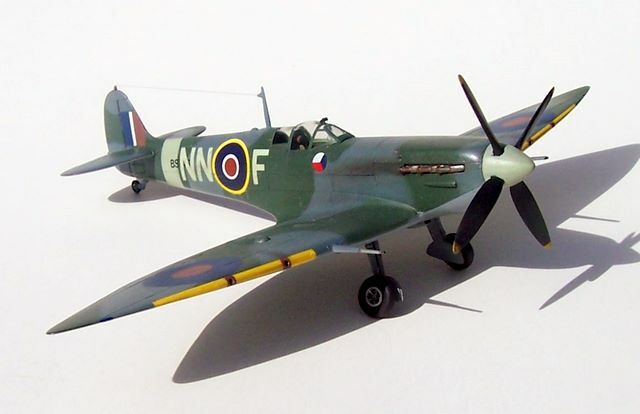 Its main faults being a lack of the gull-wing effect on the wing’s rear underside where it meets the fuselage, imperfect exhausts, and of course basic cockpit – like the exhausts, a feature of most 1/72 Spitfire kits. To correct the wing error I let in a part cut from the Airfix Mk V kit. The Revell kit offers the choice of normal or clipped wing tips, so it was a simple matter to attach the Smer extended tips, plus Smer provided the cockpit pressurisation intake. The Smer 4-blade prop was not convincing in my view, so I used a Heller Mk XVI example instead. The Smer decals were very good and problem-free. I started this kit and got it to the almost ready to paint stage about six or seven years ago, but only found the drive to finish it late in 2006. It’s no prize winner, but it serves my purpose of adding an interesting mark of Spitfire to my display cabinet.